Forgot Windows 7 Password for Your Laptop? I have an old laptop that’s not been used for quite a while, problem is that I forgot Windows 7 password on my laptop, I’ve tried many different passwords that it could possibly be without any luck. I have some important documents and pictures on there that I really don’t want to lose with a brand new windows install. Is there any way to recover or reset the password? Forgot your laptop password or someone has changed Windows 7 password on your laptop? How to reset laptop password without erasing any important files stored on your computer? In this article I’ll show you how to reset your forgotten Windows 7 password for your laptop so you can log on and regain access to your important data on your laptop. Before the work, prepare a blank CD/DVD. Then install and run Password Recovery Bundle on another accessible computer. Click Windows Password button to bring up the CD recording dialog, then burn the default ISO image onto your CD. The CD is the password reset disk we’ll later use to reset Windows 7 password. Insert the password reset disk into your locked laptop. Set the laptop to boot from the CD. Restart the computer, it will start to boot from the CD. After a while, your computer will launch the Reset Windows Password program. 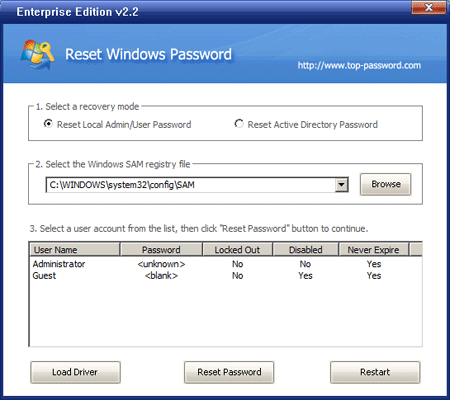 The software automatically detects the Windows SAM registry hive and show a list of user accounts existing in your Windows 7 system. Choose the user account whose password you already forgot, then click Reset Password button to reset your forgotten laptop password. Remove the CD and restart your computer. Now you’ve done the procedure of resetting Windows 7 password on your laptop. You can get into your laptop without be asking for a password. If your laptop doesn’t have a CD-ROM drive, you can create a password reset disk on a USB drive to reset your laptop password. Forgot Windows Password on Your Old Laptop?